Seven Stars Resort & Spa’s Champagne & Petals Package starts at $5,350 (including taxes and fees) and represents a savings of more than $600. Package must be booked by January 31, 2019 and is valid for stays through February 28, 2019. To book, call the property directly at (649) 941-7777 (ask for Yngrit and mention Champagne & Petalsromance package at the time of booking). All packages subject to availability and valid only for junior suite ocean front accommodations. 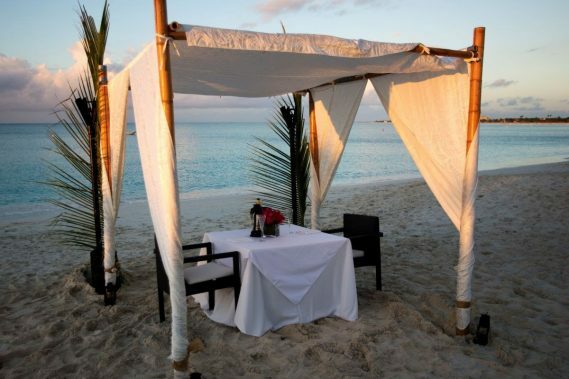 In addition to the Champagne & Petals package, couples can also enjoy a variety couples-inspired experiences year-round including private dinner for two which starts at $300 and is available on the beach, in a private cabana, or in-suite; the “Be Mine by the Sea” couples massage priced at $350; and the new Seven Stars Cocktail Master Class offered twice a week as a pre-dinner experience on Tuesdays and Thursdays from 5:00-6:00p.m. that includes an inter-active how-to demonstration and tasting of a Seven signature cocktail, along with chef-prepared bar bites and a take-home recipe card. ($20 per person for guests 18 and older). For more information on Seven Stars Resort & Spa or to book one of their seasonal getaway specials, visit https://www.sevenstarsgracebay.com/specials.